That’s the fittest reply expected…. Despite the calumny of depiction, the spirit of its presentation should be into account. Muslims should salute this one…. How many people cried when these sick Taliban shot and burned 124 young students and teachers in Peshawar last month. I think our tears are also selective. Some of us did cry for those students and teachers in Peshawar…and for the café manager and customer who were shot in Sydney…and again for the staff assassinated at Hebdo. Yesterday I found a video from you on the web about Islam. I searched for other video’s. I am impressed about your way of thinking. it’s not your topic that attracted me but the way you see it, the way you aproche it, and how you phrase it. I believe that all beings are part of the Light. Th same Light who created the Big Bang, the same Light that created the first atoms in the belly of the stars, the same Light that made life as we know possible on earth. As Light is our source, we are attracted by it. As written in the Bible, Jesus’ (Light) made a blindman ‘see’. Ms. Hazleton, you are a strong Light. Keep on radiating. No religion preaches violence. It is the misguided elements who bring a bad name and reputation to their respective religions, due to their misunderstood beliefs! It was quite a misleading cover, and could harbour unwarranted repercussions. Hope sanity prevails on both sides. That’s the thing with art, high or (as in this case) low — the viewer reads into it, and it is (as are words) always open to multiple readings. Perhaps we each choose the reading we want. And there are so many ways of reading. 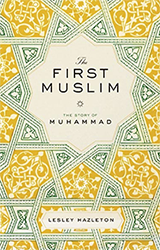 I never thought the cover meant that the editors were saying that Muhammad was forgiving them — rather that first, forgiveness was central to Islam, and second, that they forgave. How sincere this was on their part is of course another question. But since I believe it to be true that Muhammad would indeed be in tears at all this, I went with that first meaning. Professor Hazleton, I have been visiting your blog on and off, but I just want to thank you. I was a little ashamed when I saw your video ‘on reading the quran’ because you appeared to experience the book in a manner that I (as a muslim) had not done. I also read your biography of the prophet (pbuh) in a single day, because it give me a more meaningful connection with his personality. I also share your idea of doubt, because I read somewhere (i think in the works of Rumi) that doubt and faith are like two wings that keep the bird in the air and if either one is missing, the bird cannot fly. Thank you. I met a dear friend at a coffee shop the other day. I was carrying a novel by Ali Smith; she was carrying al-Ghazzali. We had a wonderful conversation about the difference between artificial light and natural light. Thank you. 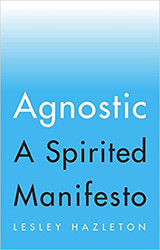 I’m currently working on the last chapter of an agnostic manifesto, to be published in early 2016. I don’t know from where to start. I can’t speak on behalf of the Muslim population here in Pakistan but I’m sure there are quite a number who will agree with me. As Wahab said, faith and doubt goes hand in hand with each other. And yes, I do have doubts. And by searching for answers, it leads me to faith, closer with every search. I am humbled, privileged, and grateful. Thank you. I have only recently come across your work, and have just ordered your two books (The First Muslim and After the Prophet). As a British born Muslim, I initially retreated from Islam in my youth, and engaged with eastern enlightenment teachings and meditation. I’m now circling back to Islam to review my inherited religion and integrate the different paths of understanding and experience that I’ve now accumulated. I am looking forward to diving into your books. Thanks, Aterah — will check them out. — L.
I don’t believe in omens, though I confess I’m sometimes tempted to. You see what I mean about omens? That was just about the time the first finished copy of the book arrived in the mail. Since it came straight from the printers, I didn’t recognize the return address, so wasn’t sure what was in the padded envelope until I opened it. I think I might have mentioned somewhere that the cover was elegantly understated. Perhaps even a tad overly under-stated. I do remember suggesting to the publishers that they increase the color values just a little – a slightly more saturated yellow as in the photo in the right-hand column, for instance. “We’ll see what we can do,” my editor said. She didn’t get back to me on that, and I hadn’t expected her to. So I had no idea that the yellow had been transformed into gold! Thus the “oh my God,” repeated several more times as I traced the raised pattern of it with my fingers. This had to be a special author’s copy, I thought. It’s been many years since publishers commemorated a book’s publication by ordering up such a one-off copy for the author (usually leather-bound, with gold leaf on the edges). It was a token of appreciation, and a lovely one, but they’d stopped doing it because of the expense. Now Penguin’s Riverhead Books imprint had clearly resuscitated the practice. So I’m still kind of amazed at the physical existence of my own book. Is this stunning production really the same creature as the innumerable drafts of much-scrawled-on typescript pages strewn around my study for years? It’s as though with publication it’s achieved a separate existence. Like a teenager leaving home, it will now make its way in the world on its own terms, an independent agent only tangentially related to me. All I can do is wish it well, cheer it on, defend it when it needs defense — and trust that others will agree that it lives up to the sheer elegance of its cover. The book looks beautiful, Lesley – and I think these are GOOD omens! Lesley- I couldnt wait to read this so I cheated and ordered in on Kindle…the gold looks unbelievably good! I cant wait to get my hands on the book itself!!!! Thank you! Many congratulations, and i want to say about omens that you are a very lucky person that you write the biography of my beloved Prophet and it gets published on the date of Prophet’s birthday i want to congratulate you for this again and from deep of my hearts, I’m no authority yet as a believer I think your books got praise from heavens. I want to buy the first copy. I love this story, and revel in your awe of your publication! Congratulations. Can’t wait to get my copy. Thank you for sharing the exquisite beauty of your new book. I saw the photo and read your comments including the significance of the Publication Date. 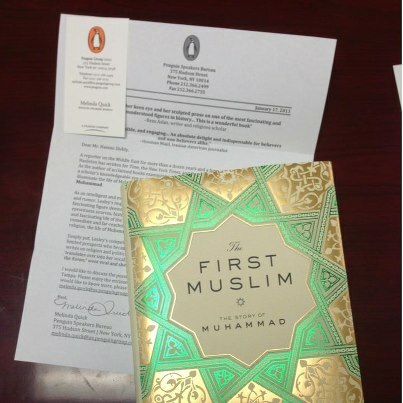 To me, this was a good omen to purchase “The First Muslim” immediately, which I just did along with “After The Prophet”. How exciting to be alive in these times that such writing is available to enlighten the general public! Advance Kudos for all your effort to birth this book! I had realised this coincidence a few weeks ago when I first saw your blog and saw the date of release as 24th. I thought you had timed it that way on purpose, but even if you haven’t I think this’accident’ is just one of the many signs of Allah endorsing your work and the amazing effort you put into all your books. 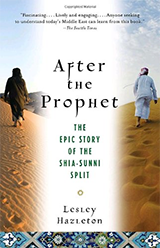 I have just finished reading ‘After the Prophet’ for the second time and enjoyed it even more than the first. Can’t wait to get my hands on this one. CONGRATULATIONS! Lesley, on the birth of this ‘baby’. The radiant ‘gold’ has the magical quality to it, peering from behind the green with such blazing energy and power. The first look sent shivers down my spine out of sheer excitement. It definitely looks much better than the yellow colour previously chosen. You must be so proud of your creation. May you enjoy the many-fold rewards each day as long as you live. May the success of this project give you the thrust to create more masterpieces. Waiting impatiently to get this book in my hands! This post brought tears to my eyes. I could ‘feel’ with you, on this issue. My people already know of me as a ‘Leslie addict’. I know I will I have to wait longer than the others to hold my own copy, until it reaches my destination in India. But having read the excerpts online, my enthusiasm is already whetted. About omens…..it’s a feel good factor actually, but for such a momentous event everything is acceptable. I loved this post. It’s so encouraging to me that authors — some of them, anyway — are still touched and amazed that something they created becomes its own thing, takes on its own life. That even after publishing so many books, the joy and amazement are there, and at least this author is not trying to play it cool by submerging the expression of it all. “It’s as though with publication it’s achieved a separate existence.” Because it HAS, don’t you see? Lesley, I’ve just started reading on my Kindle. Wonderful! Congratulations. I love my Kindle, but your blog makes me covetous of a hardcover…. I’m so glad they gave you a delicious cover. Just got yr new book after reading AFTER THE PROPHET which I really loved and thought so well written! Yes, great cov for the new book for which I immediately placed the dj in a Bro-dart Mylar cov as I did with AFTER… dj which book I obtained in the STRAND bookstore here in NYC, second-hand but new. I got the NEW book at Union Square B&N ’cause I wished a new fresh copy and not a reviewer’s copy at the STRAND. Hope you’ll be presenting/reading in NYC some time soon. Great scholarship and great read! Thanks for all your effort! I just reading my copy of your book now and here’s another omen. I started reading “The First Muslim” while I was in the middle of reading Thomas Moore’s “Dark Nights of the Soul. When I came across the term “dark night of the soul” in your book to describe Muhammad’s experience, I almost had goosebumps. It was as though your book was conversing with the other book to explain to me what a “dark night” is – a very rich learning experience with both books that is for sure! Do you have a speaking schedule/tour for 2013? I would love to see you speak if you’re ever in the area! Lovely synchronicity, Salama! Thanks for sharing. Speaking schedule is still in formation, but I’ll post dates and locations as they firm up, if not here than at http://www.TheFirstMuslim.com, as well as on Facebook and Twitter. Where are you located? Excellent, I’ll keep checking the website. I’m in Cleveland, Ohio! I became a great fan of yours since I heard you in TED lecture on ‘quran’ few years ago. Then I loved you so much I watched all of your youtube videos I could find and finally this week I saw your TED lecture on Muhammad, and I was convinced to buy your latest book the “First Muslim”. I am very disappointed. Unless you disclose the source of this passage and prove that it’s not your attribution, you simply quoted a Shia materials, I’ll start blogging against you. Check the end notes. The note for this says “This usage is discussed in Spelling, Politics, Gender, and the Islamic Past, and noted in Fischer, Iran: from religious dispute to revolution.” Both books are, of course, included in the Bibliography. I waited for the book to arrive because I was sure of it being a good read from the Ted talk I had heard which was the reason I bought it in the first place. I am still reading it for the last 3 weeks, slowly imbibing it’s message and marveling the language. I can feel the considered sensitivity, the carefully chosen language and the experience of a psychological training in almost every phrase. Objective analysis of decisions as taken by Mohammad SAWW is almost pure. Yet it is only human to diverge from it at times and sometimes I feel the bias has been allowed. For example in the detailed explanation of what is a munafiq and then to explicitly mention the paralytic situation at Hudabiya leaves room for the author to maybe take a deeper longer look at the concept in revision of it. It has opened many avenues for those who read to think about some of the situations, Muslim or otherwise alike. On the whole I have enjoyed the text,material,explanations, and the sensitive effort by the author. Thanks for the kind words, Sobia — and for the generous acknowledgment that even where we differ in how we see things, we do so in good faith. — L.